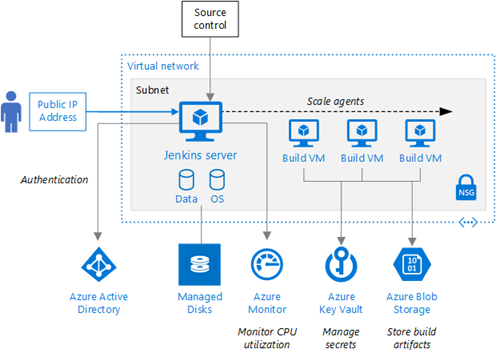 The patterns & practices (p&p) group of the Azure Customer Advisory Team (Azure CAT), has published a new reference architecture for deploying and running a Jenkins server on Azure with Ubuntu 16.04 LTS. Jenkins is a powerful open source tool for building DevOps solutions. This reference architecture helps identify the best practices for setting up a Jenkins server on the Azure platform and helps you make the most of Azure services for supporting your engineer requirements. Azure AD Plugin enables you to set up a single sign-on (SSO) experience. Azure VM Agent Plugin allows you to scale the pipeline with Jenkins agents in Azure virtual machines. Windows Azure Storage Plugin provides storage for build assets that are shared in a pipeline. Azure Credentials Plugin works with the Azure Key Vault service. Like other Azure reference architectures, this Jenkins deployment and associated resources include a GitHub repository. For example, you can download scripts that use Azure Managed Disks to support a disaster recovery scenario. You can also learn how to use the Azure Monitor service to monitor the Jenkins server or pipeline. We invite you to review the reference architecture, try out the deployment, and even contribute to this and other reference architectures on GitHub.